We understand that in today’s difficult economic times, finding the “best deal,” is important-but we also know that compromising quality and service to save a few dollars can result in disaster. We strongly encourage brides to be aware of where they are purchasing their gown, especially if they are considering buying their gown online. If your find a gown for a much lower price on the internet that seems like it is too good to be true, the truth is that is probably is! Time and time again, we’ve heard stories of brides who try on a gown at a salon, then search the designer and style number online to find the dress at a lower price. What you may not realize is that though most websites claiming to design designer gowns for less are actually selling counterfeit copies of the gowns. Bridal gown manufacturers do not sell their gowns online, they only sell their gowns through authorized retailers. Just because a website uses designer photos doesn’t mean you’ll be getting the real thing. The counterfeit gown that you receive will not be what you are expecting-which can leave you in tears and searching for another dress, doubling your expense! 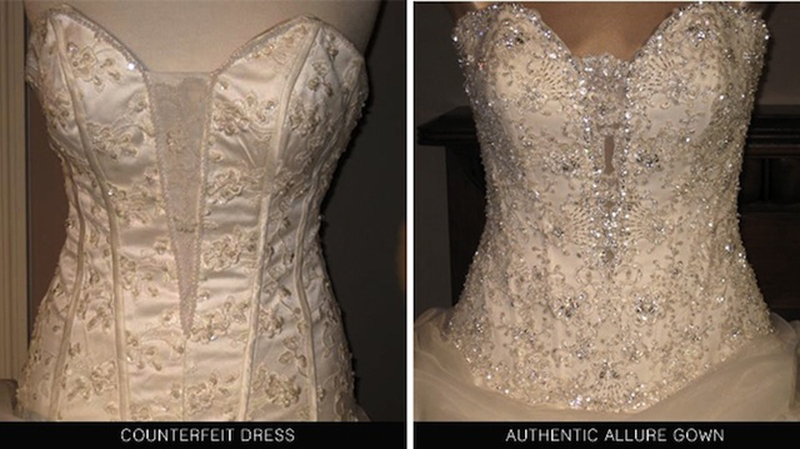 The counterfeit dresses are typically poorly constructed with thin, cheap material. The beautiful crystal embellisments that you loved on the designer’s gown will have been replaced with cheap sequins, making the dress look like a costume. The worst part of buying online is that these stores do not stand behind they’re products, meaning that if you have a problem with the gown you cannot return it, or get any money back. Some brides who have purchased a gown online never received a gown at all! If you’re looking online to purchase a gown because you think it will save you some money, try talking to a bridal consultant at a local shop instead. 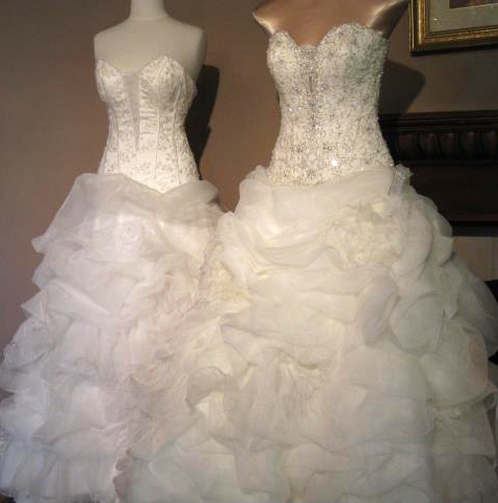 They work with represenatives of bridal designers, and will help you find a beautiful gown within your budget. Another way to save money is to ask your local bridal salons if they sell sample gowns off the rack at a discount. We strongly encourage you to visit a bridal salon that is an authorized retailer of the gown you are searching for, to ensure that a trained bridal consultant treats you with the care and knowledgable that every bride deserves! Save yourself the headache and purchase a gown that you love from an authorized retailer. You will be a happier bride when you are wearing the dress of your dreams.